Malaysia Airlines Flight 17 crash: Long-awaited Dutch report finds that MH17 was shot down by Russian-made missile from rebel-held territory. 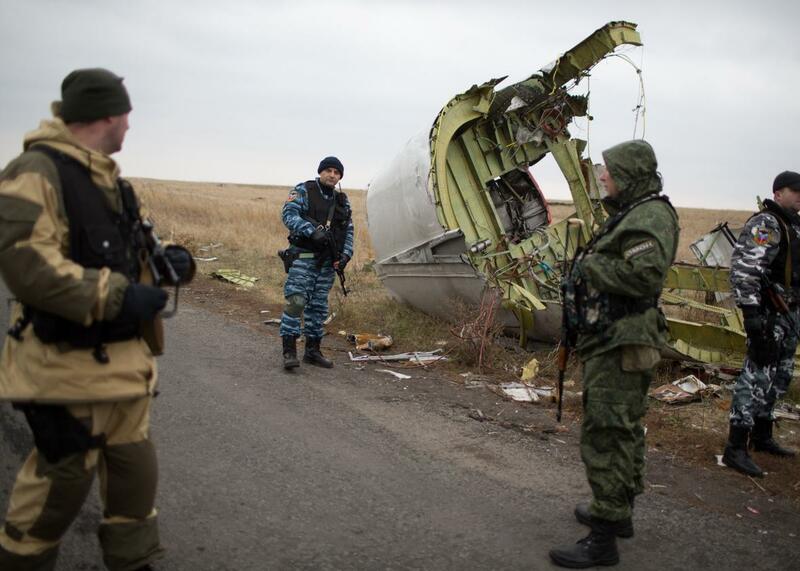 Pro-Russian rebels guard the Malaysia Airlines Flight 17 crash site as Dutch investigators arrive in eastern Ukraine on Nov. 11, 2014. A long-awaited report from the Dutch Safety Board has concluded that a Russian-made Buk missile shot down Malaysia Airlines Flight 17 over Eastern Ukraine in July 2014, killing all 298 people on board. The report doesn’t address the question of who was responsible for firing the missile, but the maps included in the report show that it was likely launched from an area near Donetsk, held by pro-Russian separatist rebels. That’s a crucial distinction: After initially arguing that the civilian airliner was shot down by a Ukrainian fighter jet, Russian authorities, perhaps anticipating the release of the Dutch report, have more recently conceded that the culprit was more likely a Buk, but one fired by the Ukrainian military. The Russian Ministry of Defense has been accused of falsifying satellite data to support its version of events. The Russian government will almost certainly deny that the report proves the rebels’ culpability. But it will be interesting to see how vociferously and publicly they push back against it. After months of blanket coverage of the conflict in Ukraine, Russia’s state-controlled media has shifted its attention to Syria, in line with the Kremlin’s new foreign policy priorities. While there’s still some sporadic violence in Ukraine, the situation is relatively quiet at the moment, and the Russian government might prefer to brush this unwelcome reminder of its last major foreign entanglement under the rug. After all, it has brand-new missile allegations to deny.